What is purpose of Payroll Costing and Transfer to General Ledger ? In Payroll area, the Costing process basically allocates payroll run which results to cost segments. The Transfer to the General Ledger process transfers cost information to Oracle General Ledger interface tables. At the installation - setting up segments of the Cost Allocation key flexfield to determine the windows in which users can select cost codes. Oracle Costing you use a post–payroll run process to accumulate payroll costs. For Oracle General Ledger you can map the segments of the Cost Allocation key flexfield to the corresponding segments of the General Ledger Accounting flexfield. 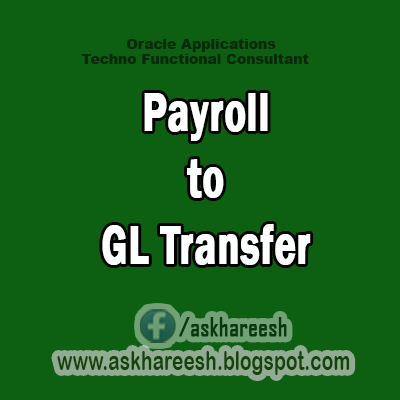 If you do not using GL in same product, you may consider how to relate information on labor costs entered in Oracle Human Resources to your financial systems.